There is something about this image that gives it a timeless feeling. It could have been photographed yesterday or 25 years ago. Is it the way the groom is holding onto his bride with both hands? Is it her traditional white rose bouquet and capped-sleeve gown? Is it the way the light is streaming through her veil? This couple's garden wedding was simple, classic, and infused with a peaceful joy. The black and white tones with just a hint of sepia emphasize its classic feel. As Vancouver wedding photographers we are always aware of the fact that the images we are capturing are forever, and are the first heirloom of the couples' newly-formed family. The Brock House is one of the most classic wedding venues in all of Vancouver. The restaurant's north lawn overlooking Jericho beach and English Bay is a perfect natural ceremony site, and over the decades many hundreds of couples have exchanged wedding vows beneath the majestic branches of the century-old maple tree. For Vancouver brides and grooms looking for a heritage venue on the oceanfront, few other British Columbia wedding venues can match what Brock House has to offer. 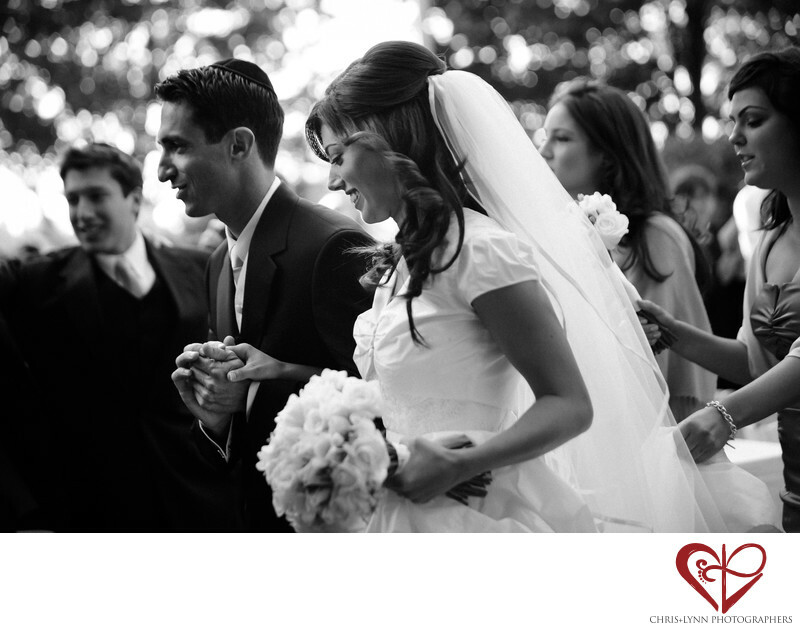 This couple's Jewish wedding was published in Vancouver's Real Weddings Magazine. Location: 3875 Point Grey Road, Vancouver, BC, V6R 1B3 (Jericho Beach) . 1/800; f/2.8; ISO 400; 80.0 mm.